This lesson is about how to get an EIN for an LLC, not another type of business or trust. Also, you can only apply for an EIN online if you have a Social Security Number (SSN) or an Individual Taxpayer Identification Number (ITIN). 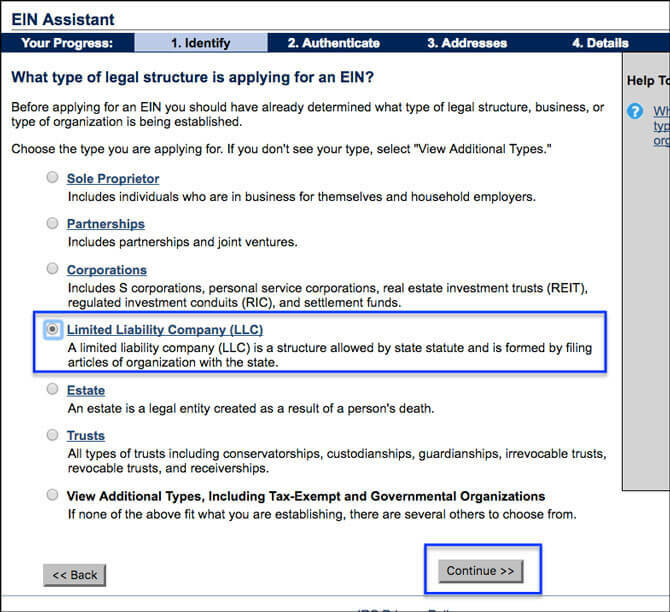 If you don’t have an SSN or ITIN, you can still obtain an EIN for your LLC. Please see instructions here: how to get an EIN without an SSN or ITIN. Skip ahead: If you’ve already read what is an EIN, feel free to skip ahead to 4:10. Note: The video above shows obtaining an EIN for an LLC in Florida, however, the steps will be similar regardless of which state you formed your LLC in. Also, this video is a few years old and a few things have changed with the online EIN Application. Please read this entire lesson before applying for an EIN for your LLC. The following information is provided for educational purposes only and in no way constitutes legal, tax, or financial advice. For legal, tax, or financial advice specific to your business needs, we encourage you to consult with a licensed attorney and/or CPA in your state. The following information is copyright protected. No part of this lesson may be redistributed, copied, modified or adapted without prior written consent of the author. An EIN or Employer Identification Number is issued by the IRS to business entities. It is also known as a Federal Tax ID Number or TIN (Tax ID Number), but for this video we will refer to it as the EIN. An EIN is to a business what a Social Security Number is to an individual. It basically identifies your business, or company to the IRS. Even though it is called an Employer Identification Number, it does not mean that you have to have employees. EINs are used for: opening business checking, savings or investment accounts; filing taxes; handling employee payroll (if applicable); obtaining business lines of credit for business loans; obtaining credit cards in the name of the LLC; and applying for business licenses. Please wait until your LLC is approved by the State before obtaining your EIN. You do not want to have any issues with an EIN assigned to the wrong LLC. An EIN is similar to a Social Security Number in that it has 9 digits. To differentiate an EIN from an SSN, there are 2 digits followed by a hyphen and then 7 more digits. Applying for an EIN is a free service provided by the IRS. This is what other websites charge between $75-150 for. We will show you how to obtain your EIN for free and in under 15 minutes. The EIN can be obtained in 3 ways: by mail, by fax, or via the IRS’s online application. Since obtaining an EIN by fax takes 4 days and by mail can take up to 4 weeks, we will focus on the online application. Again, the online application is the quickest route. Your EIN will be issued immediately after you answer all the questions in the online application. You will then be able to download, save, and print your new Employer Identification Number, as well as your confirmation letter. You will need to have the member(s)’ SSNs or ITINs ready before you begin the online application. If you are a US citizen, you will use your SSN or Social Security Number. If you are a foreign national, you will use your ITIN or Individual Taxpayer Identification Number. If you are a foreign national and you do not yet have your ITIN, you’ll first need to apply for the ITIN before applying for and obtaining your EIN. If you are a foreign national and you need to apply for your ITIN, please contact the IRS at the link below this video. You are about to watch an application for an EIN for a Single-Member LLC in the State of Florida. Do not worry if this is not the state in which you formed your LLC, and also do not worry if you are a Multi-Member LLC (with 2 or more members). The online application is pretty much the same regardless if you are a Single-Member LLC or if you are a Multi-Member LLC, or regardless of the state in which you formed your LLC. The EIN application is a federal tax procedure and is not state-specific. If you have any questions, or if there are any error messages that appear during your EIN online application, please contact the IRS. There’s a link below this video where you will find their phone number. You are now ready to apply for your EIN. Let’s head over to the IRS’s website. The link below this video will take you to the online application. Let’s get started. Here we are at the irs.gov. Online EIN Application. You’re going to scroll down towards the bottom of the page and click “APPLY ONLINE NOW”. Next, click “Begin Application”. On this page, select “Limited Liability Company” and then click “Continue”. Click “Continue” again, and on this page enter the number of members of the LLC. For this example, there is 1. You’re next going to select the state where your LLC is located. In this example, this is a Florida Limited Liability Company. Next, click “Continue”. Hit “Continue” again. Select the 1st option (“Started a new business”), hit “Continue”. On the next page, select “Individual” and hit “Continue”. You will next enter your name, and Social Security Number, and then select “I am one of the owners, members, or the managing member of this LLC” and then hit “Continue”. On the next page, you will enter your Principal LLC Address. This is also where the LLC is physically located. If you have a Mailing Address that is different than the Principal Address, then at the bottom you’re going to select “Yes” and on the next page you’ll be able to enter your Mailing Address. After you enter the LLC’s address and phone number, click “Continue”. The next page is a physical location verification. This is simply the IRS just cross-referencing your address via the database. You can click “Accept Database Version”. On the next page, you’re going to enter the legal name of the LLC, as well as the county and state it is located, as well as the state it is organized in. The state where your LLC is located in the state where it is organized will most likely be the same. 2 important things to remember when entering your LLC’s name: make sure to include the suffix “LLC” and do not enter a comma. For this example, let’s use “Rob’s Bakery LLC”. I will enter the name as follows: you will next enter the LLC’s “start date”. This is going to be the same date you’ve used in your LLC’s Operating Agreement and will also be the date in which you received your documents back from the State. Once you’ve entered all of your information, click “Continue”. There’s a few questions here they’re going to ask. For me, all of these are “No”. Take a quick read-through here and see if anything applies to you, regarding whether or not you manufacture, sell alcohol, tobacco, gambling, you know, I have a truck over 55,000 lbs, etcetera. The majority of cases it will be “No” but make sure you take a quick read-through. This questionnaire, select “Yes” or “No” and then hit “Continue”. On this page, they’d like to know what your business does. This is going to be the same thing you filled out in your Operating Agreement. In my case, this is a consulting company. What I’m going to do is I’m going to scroll down to the bottom and select “Other”. However, take a look at the categories and make sure that you put yours in the correct category. Once you’ve done so, hit “Continue”. Because I’ve selected “Other” on the 2nd page, I’m going to select “Consulting”. You’ll see how they have “Manufacturing, Organization, Rental, Repair, Goods”, etcetera. I’m going to hit “Continue”. It says “Do you provide operating advice and assistance to businesses and other organizations?” I’m going to select “Yes” and type in “general business consulting”, then hit “Continue”. On this page, they ask “How would you like to receive your EIN confirmation letter?” You can receive it by mail, or you can receive it online. Most likely you want to receive it online (takes 4 weeks to arrive by mail). Simply hit “Receive letter online”. In a few pages you’ll be able to print and save a PDF version of your confirmation letter. This page is simply a review, take a quick scroll through and make sure everything is correct. Once so, you’re going to hit “Submit”. Here is the confirmation page, where you will see your EIN assigned and the legal name of your business. It says “Important: Save and/or print this page and the confirmation letter below for your permanent records”, so I’m going to go up here and select “File Print”, just to select here and you’ll see this link here. I’m going to click that and I’m going to save that PDF file to my computer, and I’m also going to print it out. Once you are done, click “Continue”. Hit “Continue” again. And that concludes the Online Application for an Employer Identification Number. Make sure you save that PDF to your computer, and you print a copy for your records. Hours: The EIN Online Application is only available Monday through Friday, from 7:00am to 10:00pm Eastern Time. Reminder: The instructions below are only for people who have an SSN or an ITIN. If you are a foreigner and don’t have an SSN or ITIN, you can still get an EIN for your LLC. Please see the instructions here: how to get an EIN without an SSN or ITIN. • Click the blue “Apply Online Now” button in the middle of the page. • Read through the important information and then click “Begin Application”. What type of legal structure is applying for an EIN? Select “Limited Liability Company” and then click “Continue”. You have chosen Limited Liability Company. This page explains what an LLC is and what an LLC is not. Please read over the information and then click “Continue”. Tell us more about the members of the Limited Liability Company (LLC). Enter the total number of LLC Members. 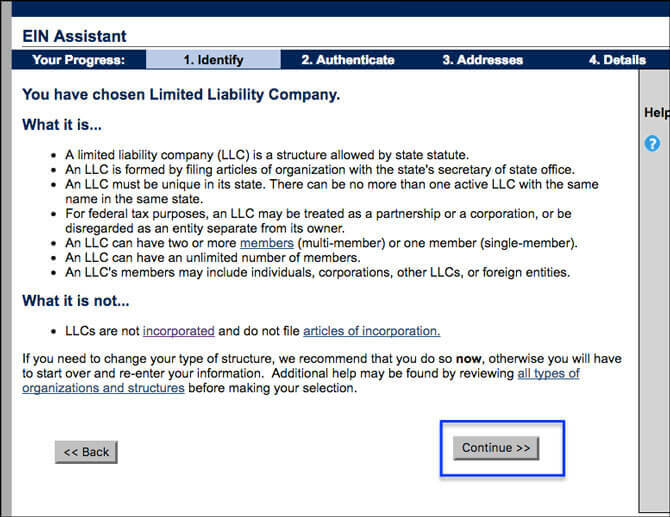 Then select the state where your LLC was formed and click “Continue”. Note: LLCs can be taxed by the IRS a few different ways. By default, LLCs with 1 member will be taxed like a Sole Proprietorship. And by default, LLCs with 2 or more members will be taxed like a Partnership. If you want your LLC to be taxed like a C-Corporation or an S-Corporation, you’ll do that with a separate form after the EIN is approved (we’ll discuss this later on). Additionally, how your LLC is taxed by the IRS has nothing to do with your LLC’s liability protection. Your personal assets will still be protected regardless of how your LLC is taxed by the IRS. 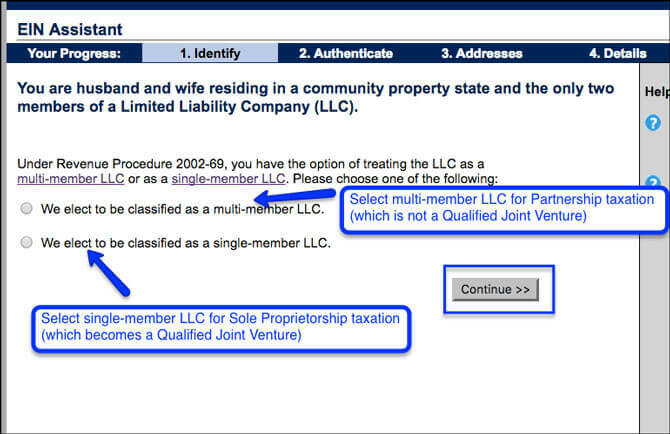 If you select 2 members and are forming an LLC in a community property state, the IRS will then ask you how you’d like to be taxed and whether or not you want to be a Qualified Joint Venture LLC. A Qualified Joint Venture LLC is when an LLC is formed in a community property state, the only owners are the husband and wife, and they file a joint tax return, they may elect to treat the LLC as being owned as one “legal unit”, meaning the LLC can choose to be taxed as a Sole Proprietorship (instead of a Partnership). So by making this election, the married couple will not be required to file a 1065 Partnership Return, but will instead report income, losses, credits, and deductions directly on their joint tax return. • If you select “multi-member LLC”, your husband and wife LLC will be taxed as a Partnership, which is not a Qualified Joint Venture. • If you select “single-member LLC”, your husband and wife LLC will be taxed as a Sole Proprietorship, which is a Qualified Joint Venture. This page will confirm and explain the IRS tax classification for your LLC. You’ll see a message stating that if you do not want to accept the LLC’s default tax classification, you can file Form 8832 and have your LLC taxed as a C-Corporation, or, more popularly, you can file Form 2553 and have your LLC taxed as an S-Corporation. Please note, that even if you plan on filing either of these forms, you’ll need to continue through the process of the online EIN application, and after your EIN is approved, you can then file Form 8832 or Form 2553. But make sure you speak to an accountant regarding which method of taxation is best for your LLC. For people starting out (earning less than $50,000 per year), it usually won’t make sense to have your LLC taxed as an S-Corporation or a C-Corporation, however, as mentioned, please speak with an accountant. Why is the LLC requesting an EIN? Most people select “Started a new business” and then click “Continue”. Who is the Responsible Party for the LLC? The EIN Responsible Party is going to be an LLC Member or Manager who has the authority to control the LLC’s money and assets. This person should also be the one who will make sure that the LLC takes care of any tax filings necessary with the IRS. If you have a Multi-Member LLC, you only need one person as the EIN Responsible Party. 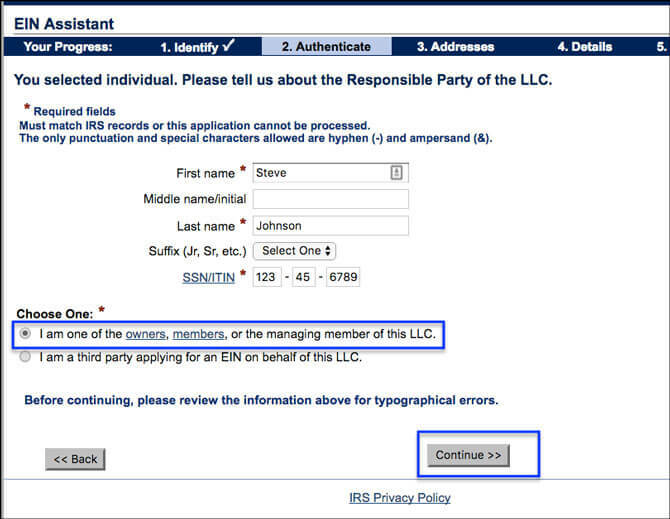 The IRS doesn’t need the contact information for all of your LLC Members (and/or Managers) on the EIN Application. Instead, the 1065 Partnership Return that is filed later will identify all the LLC Members. Another way to think of the EIN Responsible Party is that it’s the LLC’s “contact person” for the IRS. The IRS will send mail and correspondence to this person, either providing information to the LLC or requesting information from the LLC. In order to complete the online EIN Application, the EIN Responsible Party must have an SSN (Social Security Number) or ITIN (Individual Taxpayer Identification Number). If the EIN Responsible Party is a foreigner and doesn’t have an ITIN or SSN, you can still get an EIN for your LLC, you just can’t get it online. Instead, you need to file form SS-4 by mail or fax. We have instructions here: how to get an EIN without an SSN or ITIN. Although the online EIN Application says “The Responsible Party of the LLC can either be an individual or an existing business“, this is no longer the case. The IRS made changes that went into effect in 2018. For more details, please see this article: Who can be the Responsible Party for your LLC? If your LLC is owned by another company (like another LLC or Corporation), the EIN Responsible Party must be an individual person and they must use their SSN or ITIN on the application. You can’t list the parent company as the EIN Responsible Party and use its EIN (even though it looks like you can). If you do, you’ll get an error message at the end of the application. Enter your full name and your SSN or ITIN. Then select “I am one of the owners, members, or the managing member of this LLC“. Then click “Continue” to proceed. ITIN Number: If you are entering your ITIN number, please note, that there is a 30-40% chance you will receive an error message (called a reference number) at the end of the EIN Application. There are many reasons this might happen. For example, your ITIN may not be established in the IRS system yet. If you receive an error message at the end, don’t worry, you can still get an EIN for your LLC. You just need to mail or fax in Form SS-4 instead. You can find instructions here: apply for EIN with Form SS-4. Where is the LLC physically located? Enter your LLC’s physical address and your U.S. phone number. The IRS will use this address to send your LLC any mail or correspondence. The IRS rarely calls people, but in case they need to, use a reliable phone number where you can be reached. The number must be a U.S. telephone number. It can be a cell, home, or office number. A P.O. Box address is not allowed. A physical street address must be entered. Most filers list their home if they work from home or an office address if they work from an office. You can also can use a PMB (Private Mailbox Service) or a CMRA (Commercial Mail Receiving Agency) address if you have one. If you formed an LLC in the U.S., but you don’t actually have a physical location in the U.S., you can use the address of your Registered Agent (if they allow it). One such company that is “foreigner-friendly” and will let you use their address is Northwest Registered Agent. The only special characters that are allowed in the address fields are a hyphen (-) and a forward slash (/). You can’t use the number sign (#), a comma, or a period. For example, if your address is “123 Main Street, Apt. #3”, you’ll need to enter it as: “123 Main Street – Apt 3” or “123 Main Street Apt 3“. If you want mail from the IRS to be sent to a different address than you entered, select “Yes” and enter that address on the next page. The IRS will use this address as your mailing address instead of the LLC’s physical location. If the following page appears, it just means the IRS is formatting your address to match up with the “standardized format” from the United States Postal Service. You can click “Accept Database Version” and then click “Continue”. Enter the full name of your LLC, but don’t use any periods or commas. Even if your LLC was filed with the state using a comma, a period, or some other symbol, the IRS will only allow the use of a hyphen (-) and the ampersand symbol (&) in the name field. Keep in mind, this doesn’t affect the legality of how your LLC filed with the state. It’s simply the IRS “normalizing” their records for their database. Again, it won’t impact the legal name of your LLC. For example: If your LLC was formed with the name “ABC Widgets, LLC“, it must be entered as “ABC Widgets LLC“. The IRS doesn’t allow most special characters in the name field. If your LLC name includes any of the symbols below, they will need to be replaced. This field can be left blank, unless your LLC has also filed a DBA (doing business as) name. Most filers leave this blank since their LLC will just operate using the legal name it was filed under. If you previously had a Sole Proprietorship with a DBA, don’t enter that name here. That is not the same thing. Only enter a DBA if the DBA was filed after the LLC was formed and the DBA is owned by the LLC. For more information on whether or not a DBA is needed for your LLC, please see here: Do I need to file a DBA for my LLC? A lot of people read this too fast and think it says “country” (like the USA). It doesn’t. It’s the county. Each U.S. state is divided into counties. Enter the county where your LLC is located. If you’re not sure which county your address is in, you can use this tool. Enter the state where your LLC was formed. Enter the state where you filed your Articles of Organization, Certificate of Organization, or Certificate of Formation. For most filers, this field and the one above will be the same state. Note: If you’re getting an EIN for a Foreign LLC the state names will be different. Enter the month and year that your LLC was approved. You can find this date on your LLC’s approved Articles of Organization, Certification of Organization, or Certification of Formation. Read the questions carefully and select either “Yes” or “No”, then click “Continue”. • Does your business own a highway motor vehicle with a taxable gross weight of 55,000 pounds or more? • Does your business involve gambling/wagering? • Does your business need to file Form 720 (Quarterly Federal Excise Tax Return)? • Does your business sell or manufacture alcohol, tobacco, or firearms? What does your business or organization do? 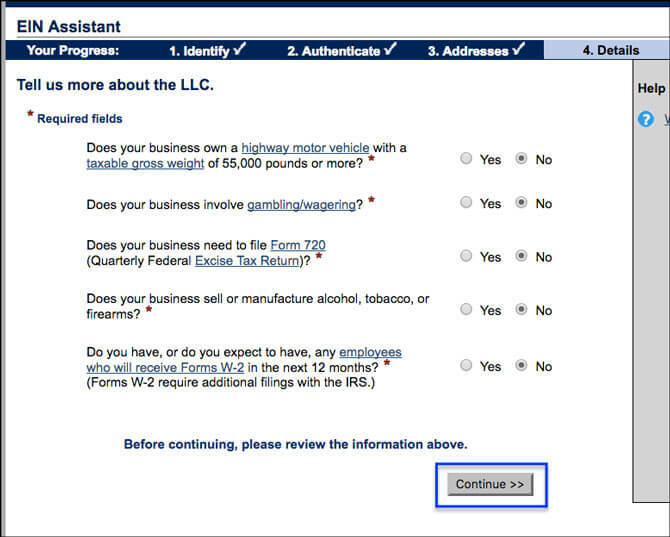 On the next page, select your LLC’s primary business purpose from the list of given choices. If it does not fall in any of the choices provided, you can select “Other” and then specify your LLC’s business purpose on the next page. Once you’re done, click “Continue”. How would you like to receive your EIN Confirmation Letter? We recommend selecting “Receive letter online” as this is the fastest way to receive your EIN Confirmation Letter. Review the information you entered, then click “Submit” to finalize your application. Congratulations, the EIN for your LLC has been successfully assigned! You’ll see a message confirming that an EIN has been successfully assigned to your LLC. Click the blue download link to save and print a PDF copy of your EIN Confirmation Letter. Then click “Continue” twice to end your online application. The technical name for your EIN Confirmation Letter for an LLC is the CP 575. Again, make sure you download and save a few copies of this form. The IRS will also mail you a duplicate copy, which will arrive in 4-5 weeks. If you misplace the EIN Confirmation Letter, you can always call the IRS (1-800-829-4933) and request another letter. The IRS won’t be able to issue another CP 575, but that’s okay; they’ll issue another type of EIN letter called the EIN Verification Letter (147C). 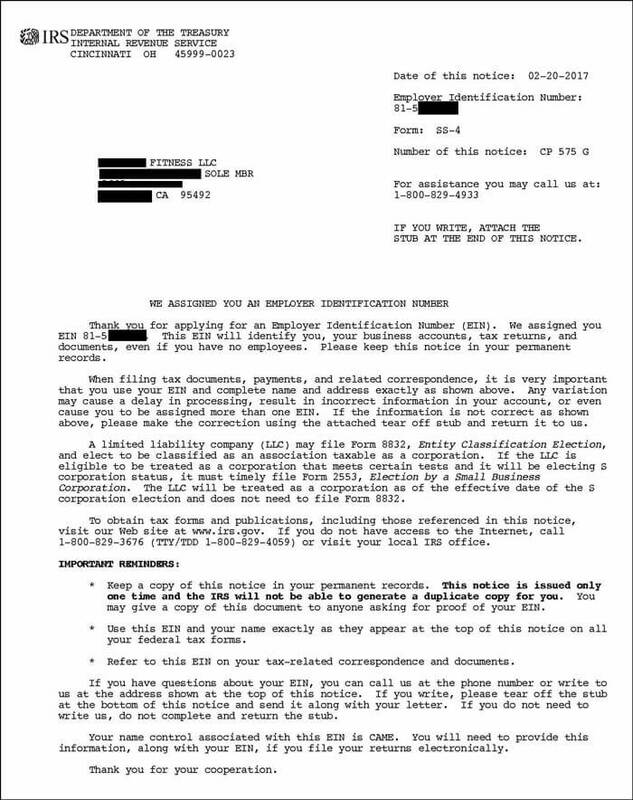 Page 2 has a “cut out”, but you don’t have to mail this into the IRS unless you are sending in a letter and making changes to your LLC’s EIN (which you might do at some point in the future). There are a number of different error messages (called “EIN reference numbers”) that you may receive at the end of the application. There are many reasons why an online EIN Application may be rejected. Please reference this page (what do these EIN reference numbers mean?) for more information. And if you need to file Form SS-4 instead of the online application, you’ll find those instructions here: how to apply for EIN with Form SS-4. 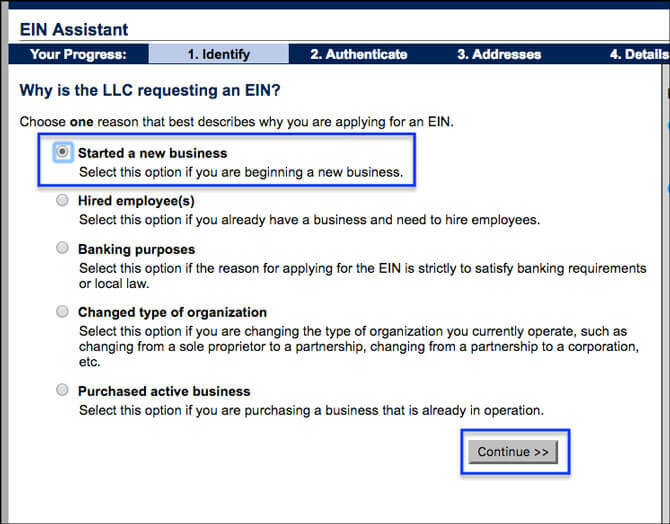 Once you get an EIN for your LLC, you’ll be able to open an LLC business bank account. If you have any questions while going through the online EIN Application (or you receive any EIN reference numbers), you can call the IRS at 1-800-829-4933. The IRS hours are Monday through Friday between 7am and 7pm. The earlier you call, the shorter the wait times. The information entered in a articles of incorporation form is public, you can pull up an entity’s completed forms on a secretary of state website. In that same way, can you pull up a copy of a completed EIN form for a given entity? Hey Jake, great question. No, the information you submit to the IRS is private. It does not go on public record. What is the importance of waiting for the LLC approval before applying for the EIN? Is it just in case there is an issue with the filing? Btw, I have a tip for you in regards to filing in Iowa. You can receive an expedited filing (currently standard wait time is over 3 weeks for filings made by fax/mail/online). if you file in person AND request that the filing be expedited it can be expedited which is 2-3 days currently. Great site – thanks for having it! Nevermind, I actually watched the video and I now understand why the advice is to wait on the filing before applying. Awesome, glad to hear! Thanks for notes on Iowa! Sometimes we leave out the in-person expedited information so we don’t make our content too long and confusing (since not everyone is close enough to file in person and we don’t get asked that much)… however, we’ll think about adding it back in. Thanks for the feedback JD! At the step of EIN applying process Where is the LLC physically located? There is a note says: Must be a U.S. address. As an LLC formed by a foreigner, how could the fields be filled? Hey Frank, what state did you form your LLC in? Where is your Registered Agent address? Did you hire a Commercial Registered Agent? If so, which company? And do you have an ITIN? If not, you won’t be able to submit the EIN application online, but instead will need to mail or fax Form SS-4 to the IRS. You don’t need an SSN or ITIN to get an EIN for your LLC. We have instructions here for foreigners: how to get an EIN as a foreigner (no SSN). Hope that helps! Hey Frank, thanks for the info. What address is listed as your registered office (“Second”) in your Delaware LLC Certificate of Formation? Hi Matt, it’s an address in Delaware. It says like this, is located at xxxxxx Coastal Highway, Lewes, Delaware 199xx. Hi Frank, if you’re able to go through the EIN application online (many filers with ITINs get an EIN error message) you’ll use this address for where the LLC is physically located, but check off that your LLC has a different mailing address and enter your address in your country of residence. If filing SS-4 by mail or fax, you can just enter your mailing address located in your country of residence in 4a and 4b, and then for 6, enter “Sussex County, Delaware”. Hope that helps. Hi Matt, thank you for your prompt reply. I’d like to go along with your instructions to get ITINs and EIN. I’ll post here about what I come with. Hi Matt, I have just received the fax with EIN on it from IRS. Since I have no SSN or ITINs as a foreigner I have to fill SS-4 form and then faxed it to IRS according to your instructions. IRS has a statement on its web site says you can receive your EIN by fax generally within 4 business days but it’s not true, I received mine at seventh day. It’s not too bad though. Thanks again for your helpful information. Hi Frank, thanks for your helpful comment. Yes, often when submitting an EIN as a foreigner, approval times can take longer. We’ll make sure to update this page with more details about that. Also, we’ll be making a separate instructional page just for foreigners, so we’ll make sure to include it there as well. Thanks again! 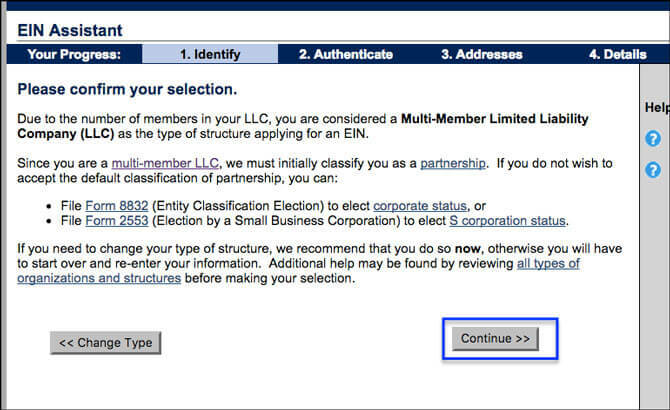 *UPDATE* Here’s the new instructions for anyone else reading: how to get an EIN for your LLC without an SSN or ITIN. Hello Matt, I formed a LLC company several years ago in Hawaii. It was dissolved less than 2 years ago. And now I was able to re-register the LLC with the same name again recently and got approved. So my question is that do I need a new tax ID or can I use the same tax ID from before when I first form the LLC company ? Any advise will be very much appreciated. Thank you in advance. Hi David, this is an interesting question. I’m not immediately sure about the answer to this. My guess it comes down to is this the same company or is this a new company with the same name? Also is the ownership of the company different now? I believe that’s what the IRS would be most concerned about. Has the business purpose changed? I also recommend running this question by a few accountants. Hi Dave, we researched this further and also spoke to the IRS. First, did you file ‘final’ Partnership 1065 returns for years after the LLC was dissolved (I’m assuming 2016 and 2017)? If not, make sure you get that done (even if “zeroed out” returns) since the IRS will be looking for them. The IRS’s rule is this: since you filed a new Articles of Organization you should obtain a new EIN. 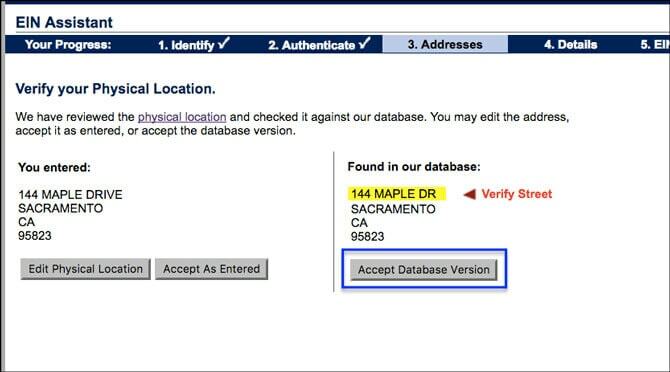 However, if you use the online EIN application, you’ll get an error/reference number (it won’t work) since the identical LLC name is already linked to your SSN as the Responsible Party. So you’ll need to apply for your EIN with Form SS-4. However, if you don’t property notify the IRS, they’re just going to send you confirmation of your existing EIN (since they won’t recognize that the LLC is new). So, in addition to the SS-4, also send the IRS a copy of your new LLC’s stamped and approved Articles of Organization as well as letter explaining the situation. You can fax it to 855-641-6935 or mail it to: Internal Revenue Service, Attn: EIN Operation, Cincinnati, OH 45999. The IRS will then send you a new EIN by mail or fax. Fax is about 4-7 business days. By mail is about 4-5 weeks. Hope that helps. Thank you so much for your help. Really appreciate your effort. Thank you for providing this great content. I am a software developer, and I have just branched out on my own as a private contractor. Your site has been an invaluable resource. On the question,“Do you provide operating advice and assistance to businesses and other organizations?” I selected, “Yes.” But, after further reading, I believe I should have selected, “No.” Is this something that I can ammend? Is there any reason to do so? Hey Tiffany, you’re very welcome! It’s not a big deal. There isn’t really an easy way to amend the EIN application. Instead, you could cancel the EIN and then apply for another one. Hope that helps. Can I add a DBA later on to my LLC after getting an EIN to the EIN? Or is it just attached to my LLC so it won’t matter? Hi Umar, correct, it doesn’t matter since the DBA is a “nickname” for your LLC. If your LLC had 20 DBAs, all taxes “flow” to the LLC since all those DBAs are again, just “nicknames” for the LLC. You can create a DBA owned by your LLC at anytime in the future. Hope that helps. I have an LLC and using a Commercial Registered Agent’s address. When completing my application for my EIN do I use the address for the Registered Agent or my actual home address? I would much rather use the Registered Agent address, but I don’t want to complete the application wrong. Hi Su, you’ll want to use the best mailing address for your LLC. For many people, that is likely their home address. Some Commercial Registered Agents (like Northwest Registered Agent) will let you use their address here and then they’ll scan your mail. If you’re using a different Commercial Registered Agent, you’ll want to check with them ahead of time. Hope that helps. I filed an LLC in my state of Colorado with the a period “.” in the name. I see that this punctuation is not accepted by the IRS when applying for the EIN #. Will it be a problem that my LLC in Colorado has the period “.” in the name, but the EIN does not? Hey Jason, short answer is no, it won’t be a problem. It’s not the IRS doesn’t accept them. More technically, they “normalize” they records by ignoring/disregarding/removing it. Most of my LLCs have the comma on the state filing, but my EIN Confirmation Letters don’t show them. It’s super common. Hope that helps! I was walking thought he UTAH business registration site and it says I need the EIN before I can complete my LLC registration. In your video you recommend completing the state process 1st. I know you have not done a UTAH tutorial yet, but any thoughts on this. Considering my fairly unique LLC naming, I’m pretty confident I can take the chance on timing but wanted to get your thoughts. Hi Todd, looks like Utah’s LLC filing is a “one-stop” process. We haven’t done a deep dive yet, but they usually form your LLC and register it with other state agencies. In the case of the Utah, that’s the Utah State Tax Commission, the Utah Labor Commission, the Utah Department of Commerce, the Utah Department of Workforce Services, and the Utah Department of Environmental Quality (if applicable). This is why they may be asking for the EIN (but I’m not sure if it’s required). You can do as you suggest… apply for the EIN first and hope the LLC goes through later. If there’s an issue, just cancel the EIN and then get another one. Hope that helps! Hi, I notice if you put an apostrophe that it will not go through. If I take the apostrophe off it will go through but technically it wouldn’t match the LLC’s proper name.Example Tim’s Bakery LLC would not be acceptable because of the special character .What should I do? For more information, please see IRS Online EIN Frequently Asked Questions. Hope that helps! Thank you so much for this service! I’ve never started a business before and you helped me save time and money with the easy-to-follow steps. I highly recommend this site to anyone who is unsure of what to do to start their own business! Hi Dlorah! You’re very welcome :) Thank you so much for your lovely comment! Hello! I just filed article of organization and now applying an EIN number. But when I finished all the detailed questions, it is shown：“DECEMBER (The closing month of the accounting year is defaulted to December due to your organization type. To change your closing month of accounting year, complete Form 1128. )” Since I started my LLC legally in December, but not any action yet. Should I fill the form1128? or since there is not any activities in my LLC, should I just ignore it? Hi Holly, for accounting and tax purposes, having an LLC run on the calendar year (Jan – Dec) is the most common setup. You may be confusing this and the LLC effective date, but I can’t tell exactly by your question. You don’t need to file Form 1128 unless you want your LLC to run on a fiscal year (instead of a calendar year). Hope that helps. If I use a regesitered agent and I put my home address for LLC physical location, for county LLC located should I put the county of the registered agent or the county where I live? Hi Melissa, I believe you’re filing in New York. You can put the county where you live in the EIN application. Hope that helps. We have formed a 2 member LLC, I understand that we will be taxed as a partnership. When I go to the screen to apply as a partnership I noticed that we cannot add LLC to the name of the business. Will that be a problem when going to the bank to open an account as the LLC? Hi Linda, you shouldn’t check off Partnership at that step. You should check off LLC. Then later it’ll ask for the number of members. That’s how the IRS knows to tax your LLC like a Partnership. If you applying incorrectly, you can apply for a new EIN then cancel the first EIN. I filled out an SS-4 to obtain an EIN for an LLC. On the application I mistakenly listed the LLC as 2 members and it should only be a 1 member LLC. In October I submitted, in writing, a request to the IRS to change the LLC to 1 member but have not had a response. Is making this change critical or not a big deal? The IRS should respond to written requests within 30-45 days. Yes, you’ll want this updated since their systems are going expect a 1065 Partnership return to be filed. I’d call them this week and ask them to look into it. You want to get it squared away. 800-829-8933. They open at 7am. Call early for very quick response time. Hope that helps. First of all I have to thank you for helping me to file my Certificate of Organization! The step by step guide is just Phenomenal!!! On the other hand; I see that in the Certificate of Organization ther is an Entity Identification Number, so is that the same as EIN? So sorry if the question is silly; I just want to make sure that I am doing everything right. Also; I have had my business as a sole propietor for a couple of years and now I just form my LLC, so at the time of completing the EIN application it asks “Why is the LLC requesting an EIN? Should I answer: “Change type of organization”. Hi Adriana, you’re very welcome :) No, the Entity Identification Number is a state-issued number. It’s different than the Employer Identification Number. Although I see now they both have the same abbreviation. Yea, that could be confusing lol! 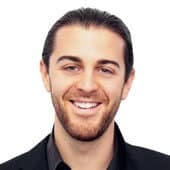 No, you’ll want to select “Limited Liability Company (LLC)” on the first step of the EIN Application, then “Started a new business” a few steps later. Hope that helps. I used Northwestern as company’s registered agent. For the part of the online EIN application that asks for the company’s physical address, should I put my home address (where I work from), or the registered agent’s address? I’m planning on moving soon this year. But I also normally use my home as a place of business and use it as a deduction on my taxes the last few years before the LLC formed. Hi Alex, for physical location, you can use where the business is actually located. After you move, you can update your address with the IRS using Form 8822-B. 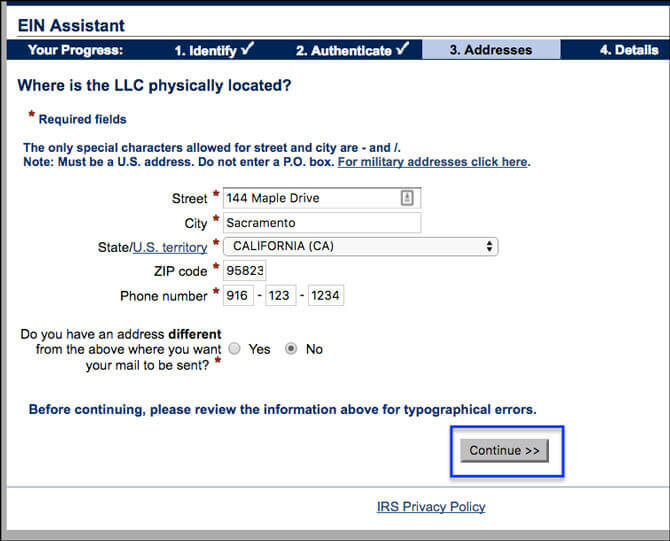 We have instructions here: how to change LLC address with IRS. Hope that’s helpful! I’m starting an LLC but currently, don’t own a physical address/ building for the business yet. Do I have to get a building before applying for my E.I.N. Hi Lee, no, you don’t. You can use any mailing address you’d like when applying for an EIN for your LLC. Hope that helps. I just wanted to say THANK YOU! You guys have helped me understand LLC world, making it easy to understand, well organized and helping us make it as affordable as possible. May God bless your good work! Hi Matt – while applying for LLC, It was just 1 member (myself). But now I am planning to include additional 2 members on operating agreement. Do I need to apply for new EIN or can continue to use an existing EIN and just need to make election during tax time? Hi Sumeet, you don’t need to a new EIN, but you will need to file Form 8832 and change your tax election to Partnership. Unless you want the LLC to be taxed as an S-Corp or C-Corp. But if you’re just starting out, I’m guessing you meant Partnership taxation. You’ll also want to amend your state filing if Members are listed. Hope that helps. Oh My Goodness….this was AWESOME! Thank you….you could not have made this more simple…I really appreciate the STEP-BY-STEP instructions. So helpful and such a savings!! I do have a question….not your fault! I left a letter out of the business name when filing for the EIN, however EIN was issued. I have the name correct in the Articles of Organization that I filed. How to do I make the correction for my EIN? Hi Jerri, you’re very welcome :) Thank you for the awesome comment! Check out change LLC name with IRS. You can mail a letter to the IRS changing the name. I’d also include a note (or a second page) just letting them know you entered your LLC name incorrectly the first time and that’s why you’re changing the LLC name. Make sure to include a copy of your approved state forms. Hope that helps! Great content! Thanks so much for putting all of this together! I have a question about my LLC. I jumped the gun on the first few steps on my small business as I was hoping to grow from a part-time to a full-time business. I got busy with my actual job and life, and never got around to getting my EIN or anything afterwards. I also haven’t actually done any business/performed any services since filing with my state to become an LLC. I guess my question is: for tax purposes does the IRS expect me to pay taxes from the moment my state approved my LLC, from the moment I file my EIN, the moment I make money, something else? Hey Steve, you’re welcome! No, the IRS doesn’t expect taxes just because there’s an EIN in place for an LLC. As the LLC owner, it’s your responsibility to report any income. Or, if there’s no income and you want to write off expenses, then you could also file in that case. But if there’s no income or expenses, credits, or deductions you want to take, you don’t have to file with the IRS until there is an obligation to do so. Aka, there is income to report. So there’s no harm in obtaining an EIN for your LLC. Hope that helps. I should have found this awesome site earlier. I made a mistake when applying for an EIN number online. I didn’t enter LLC in the legal name. What is the best solution to add LLC in the legal name? 2. or Submitting Form to amend the legal name which takes for weeks? 3. Is there any way to cancel/remove the previous wrong legal name without LLC? Sorry for the too many questions. but please help me fix this issue. If I had known this site, I wouldn’t have made any mistakes.. Thank you for your awesome site and help. Hey Charlie, thanks for the kind words :) When you applied for your LLC’s EIN Number, on the first question (“What type of legal structure is applying for an EIN?“), did you select LLC or Sole Proprietor? 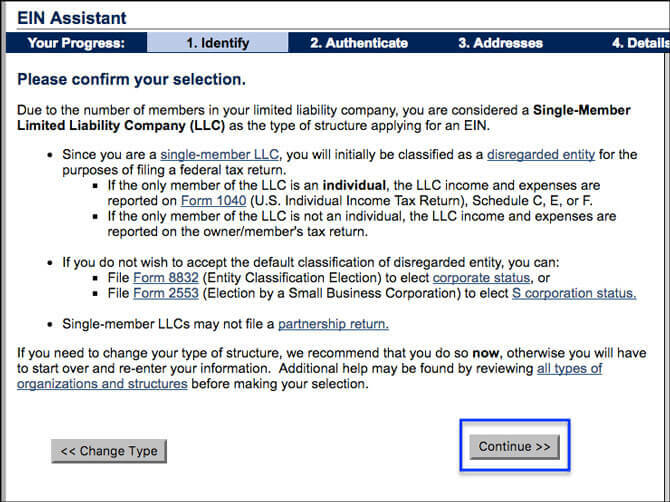 If you selected LLC, and then later on the “Tell us about the LLC” page, you forgot to enter “LLC” in the “Legal name of LLC” box, then you can just send a letter to the IRS getting the name updated. Please see this page: how to change LLC name with IRS. You can mail that letter, adding “LLC” to your LLC’s name. Also, include a note that you forgot to enter “LLC” in the EIN Online Application. Also include a copy of your approved LLC’s state filing. Hope that helps! I just want to thank you for this site. This site is so cool and helpful. It’s made starting an LLC fun and uncumbersome. Matt. Great Q&A board. My wife and I created a LLC and obtained an EIN for it (online). I had intended on making this new LLC the sole member/owner/proprietor of a larger “ownership” LLC that will eventually be made up of our LLC and other smaller LLCs. Because the LLC I first created was online, I cannot apply for the “ownership” LLC’s EIN online. Both our LLC as well as the “ownership” LLC have been approved by the secretary of state’s website and have articles of incorporation. According to IRS instructions on filling out the SS-4 (to be faxed), 7-A and 7-B must be completed by an individual and not an entity. How do I properly complete the SS-4 for the “ownership” LLC when it’s sole member is also a LLC? Thank you. Hi Matthew, thanks! The IRS did make some changes regarding the EIN responsible party. We have that info here: EIN responsible party for LLC. And we have instructions on SS-4 by mail or fax here: applying for LLC EIN with Form SS-4. Hope that helps! I’m trying to get an EIN and running into an error after submitting. The LLC was formed in Delaware and business is in California. Wondering if this is causing the issue. 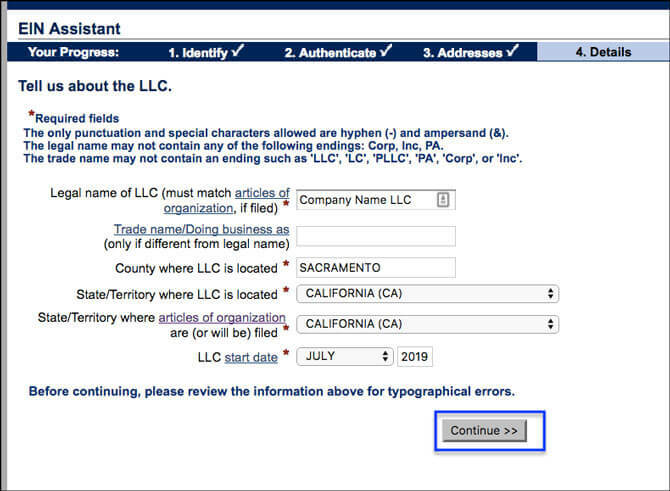 On the page where county and state of business and state of LLC formation info is entered it has California for business state and Delaware for LLC. IS this how it should be? Hi Matt, that is likely not what is causing the error. Please see EIN Reference Numbers. That should help you troubleshoot the error message you are receiving. Hope that helps. It is a 109 error so will try again tomorrow. 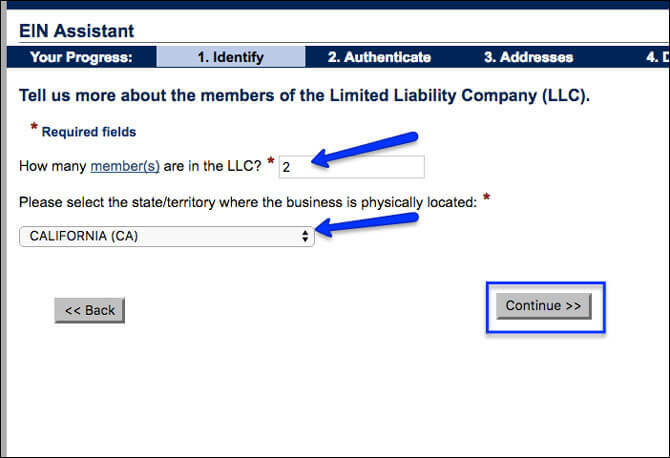 For the “Identity” question when it asks for where is the LLC physically located would I say Delaware (where it was formed) or California where the business address is? You’re welcome Matt! Yes, Error 109 is a “wait 24 hour” one and it’s fairly generic. If you do need to call the IRS, make sure to do so early in the morning (for shorter hold times) as we’re now entering peak filing season. For the “Identify” question, you can select California. Having said that, it wouldn’t have a material impact if you selected Delaware (unless this was a Qualified Joint Venture LLC). Later on in the EIN application, they’ll ask for state where the Articles of Organization, or equivalent (in your case the Certificate of Formation) was filed. Overall, the IRS is looking at the federal tax treatment of the LLC and from an address standpoint, they just want the most reliable address where they can send correspondence. Is your Delaware LLC registered as a foreign LLC in California? If not, it should be since it’s doing business in California. Your LLC will also need to file California Franchise Tax, Form 568, and may be responsible for other California filings as well. Hope that helps.